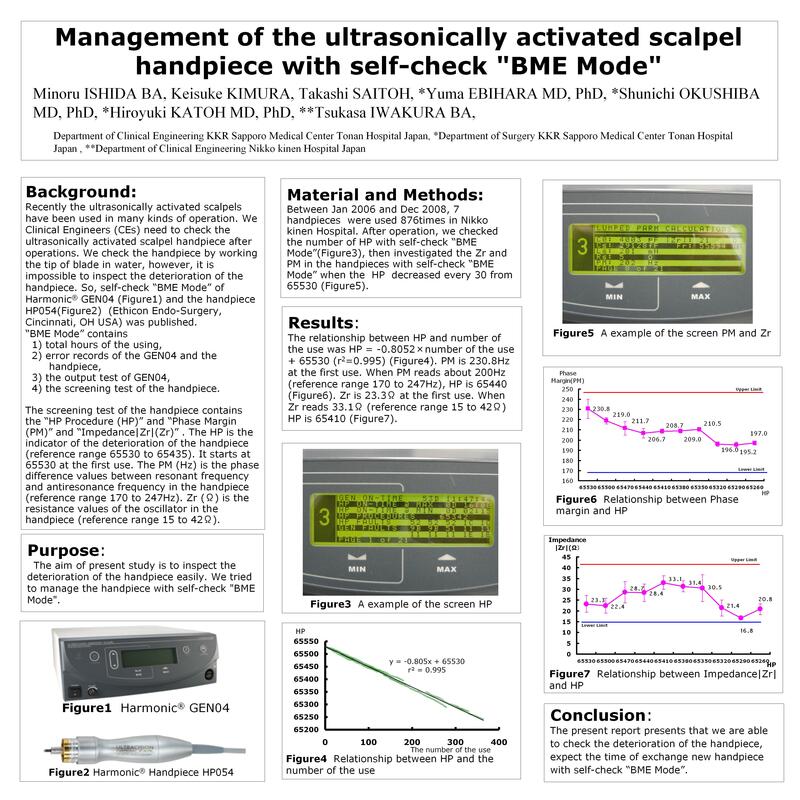 Management of the Ultrasonically Activated Scalpel Handpiece with Self-check “bme Mode”. Recently the ultrasonically activated scalpels have been used in many kinds of operation. Clinical Engineers (CEs) need to check the ultrasonically activated scalpel handpiece after operations. We check the handpiece by working the tip of blade in water, however, it is impossible to inspect the deterioration of the handpiece. So, self-check “BME Mode” of Harmonic® GEN04 and the handpiece HP054 (Ethicon Endo-Surgery, Cincinnati, OH USA) was published. “BME Mode” contains 1) total hours of using, 2) error records of the GEN04 and the handpiece, 3) the output test of GEN04, 4) the screening test of the handpiece. The screening test of the handpiece contains the “HP Procedure (HP)” and “Phase Margin (PM)” and “Impedance|Zr|(Zr)” . The HP is the indicator of the deterioration of the handpiece (reference range 65530 to 65435). It starts at 65530 at the first use. The PM (Hz) is the phase difference values between resonant frequency and antiresonance frequency in the handpiece (reference range 170 to 247Hz). Zr (Ω) is the resistance values of the oscillator in the handpiece (reference range 15 to 42Ω). The aim of present study is to inspect the deterioration of the handpiece easily. We tried to manage the handpiece with self-check "BME Mode". Between Jan 2006 and Dec 2008, 7 handpieces were used 876times in Nikko kinen Hospital. After operation, we checked the number of HP with self-check “BME Mode”, then investigated the Zr and PM in the handpieces with self-check “BME Mode” every 30 decrease of the HP number. The relationship between HP and number of the use was HP = -0.8052×number of the use + 65530 (r2=0.995) . PM is 230.8Hz at the first use. When PM reads about 200Hz (reference range 170 to 247Hz), HP is 65440. Zr is 23.3Ω at the first use. When Zr reads 33.1Ω (reference range 15 to 42Ω) HP is 65410. The present report presents that we are able to check the deterioration of the handpiece, expect the time of exchange new handpiece with self-check “BME Mode”.